Goetten Apartamentos S.L. "GoettenMar" is located in the town of Playa de Aro, within the autonomous region of Catalonia in the province of Girona in the Baix Empordà district on the Costa Brava, in the north-east of Spain. The apartment houses are quietly and centrally located in a residential neighborhood surrounded by pine trees, and only 250 m from the main beach on the Mediterranean Sea. 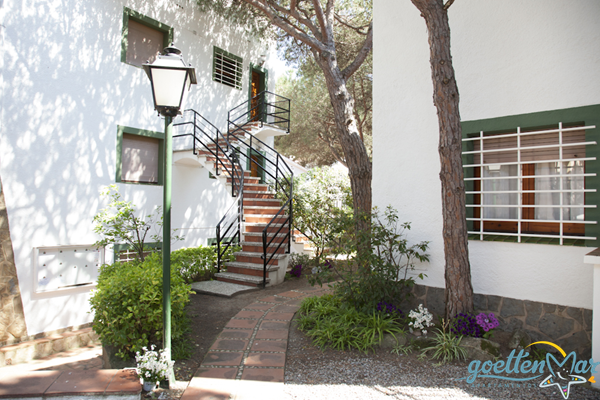 The center of Playa de Aro is within 400 m. GoettenMar consists of five houses with a number of different apartments that can accommodate 1 to 6 people. GoettenMar, furthermore, offers a reception with information desk, a bistro-restaurant, an indoor swimming pool, miniature golf, and a coin-operated laundry. Our "Bistro ChiaraMar" and its bar offers the ideal space for your physical wellbeing and relaxed social atmosphere. In the bistro and on the terrace, we provide small snacks, an internationally diverse menu and a daily lunch option. Here in the "heart" of the Apartamentos GoettenMar you will meet to eat, to chat, to laugh and to enjoy your vacation in the most delightful way. There is a traditional barbecue evening every week; but at any time, you are welcome to order breakfast or half-board on the spot. Our Reception Team can provide you with information about your holidays and your stay with us: you can make phone calls, buy stamps, and leave your mail to be sent, including having your mail forwarded to us. For a small rental fee, we also provide safety deposit boxes for your valuables You can receive your e-mails free of charge at our guest PC. In addition, we help you organize all your holiday activities and desires. You can rent cars, get bus schedules, buy tickets for boat trips, and much more. For many years, we have been working together with a renowned travel company, which offers regular attractive day trips; booklable through us. Inquire with us for any you suggestions for your activities in and around Playa de Aro, whether on foot, by bike, car, bus, or by sea. Just have a look. We are looking forward to your visit and will gladly assist you with any advice or assistance. Our staff members ​​are fluent in German, Spanish, English, French,Dutch, Italy and Catalan. The vacation center closes from November 1 until 20th December for Renovation and Maintenance operations. You can reach us, nevertheless via email for any wishes or reservations. Please take into consideration that any response during this time will take a little bit more time to respond and address. There are excellent opportunities for the practice of your favorite sport. Our minigolf facility and heated indoor swimming pool - which are exclusively for the guests of GoettenMar - but also the town of Playa de Aro, as well as the surrounding countryside, provide numerous options to engage in physical and fun activitity. Our well versed staff holds a weekly information cocktail hour to inform our guests about activities in the area and is otherwise available to answer any questions. Guests will have access to a laundry room fully equipped with coin-operated washing machines, a coin dryer and an ironing station. Why choose a vacation apartment? It is quite an easy and obvious decision to opt for a vacation apartment. While staying with us, you can freely create your own experience. When renting a vacation apartment, you are independent of meal times; you can spend your holidays according to your own ideas; and you can fully make use of GoettenMar facilities, for instance, rent a bicycle and get a rental car delivered to the door of the reception. In short, the stay in a GoettenMar vacation apartment gives you the feeling to be on holidays "within your own four walls," making full use of the advantages that our reception offers, which goes beyond the normal services a hotel offers.